New Bremen junior quarterback Nolan Bornhorst looks to pass during a nonconference game against Mississinawa Valley last Friday. Bornhorst threw for 167 yards and four touchdowns. ANNA — There are several intriguing Midwest Athletic Conference matchups this week, which is the first of league play. 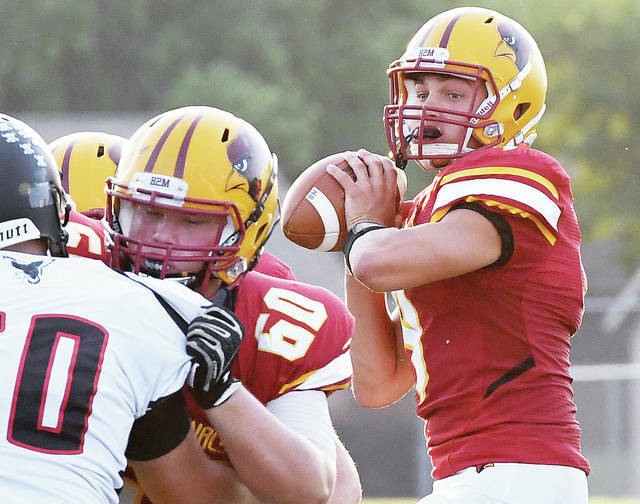 Friday’s matchup between New Bremen and Anna may be the most intriguing, though, as it will be an opportunity for New Bremen to prove it can be a MAC contender and for Anna to prove it hasn’t dropped off drastically from a 7-3 campaign a year ago. Statements aren’t Anna’s priority, though — only a conference win is. The Rockets beat Brookville 48-27 last Friday to even their record to 1-1. It was a big win following a 42-27 Week 1 loss to Middletown Fenwick that Marino said included improved offensive and defensive execution. Marino said the improvement needs to continue against New Bremen (2-0), which routed Benjamin Logan and Mississinawa Valley in nonconference games. Anna’s defense allowed an average of 349 yards and 34.5 points in the first two games. New Bremen is looking for a breakout season. The Cardinals got their first MAC win since 2012 last year and have been rolling so far this year. New Bremen averaged 330 yards of offense and 37.5 points in its nonconference wins while allowing an average of 205.5 yards and 10 points per game defensively. Junior quarterback Nolan Bornhorst has thrown for 269 yards and five touchdowns. The Cardinals have been spreading the ball out, as six players had rushing attempts against Mississinawa Valley and five caught passes. The Rockets offense has been moving well. They averaged 349.5 yards and 37.5 points in the first two weeks as junior quarterback Bart Bixler and running back Riley Huelskamp proved difficult to stop. Bixler has thrown for 205 yards and run for 173 while Huelskamp has run for 243 and five touchdowns. Fort Loramie earned its Labor Day holiday. The Redskins had to make two trips to Cincinnati Madeira — an over 90-minute drive — in busses on two of the hottest days of the summer after lightning on Friday night forced the conclusion of a nonconference game to be postponed to Saturday. Fort Loramie was able to close out the 45-29 win on Saturday to even its record to 1-1 heading into a Cross County Conference opener against Covington this week. The Redskins had 360 yards of offense against Madeira. They built a 28-3 lead on Friday before the game was postponed. Covington dropped to 0-2 last Friday with a 39-26 loss to Minster, which beat Fort Loramie 34-14 in Week 1. The Buccaneers struggled offensively in a 22-0 season-opening loss to St. Henry but got moving against the Wildcats. They had 11 first downs and 294 yards of offense, of which 224 came through the air. Watching film, Wells said he saw a big change from Covington’s offense from Week 1 to Week 2. Lehman got its offense going late in a nonconference game at Miami East last Friday, but couldn’t mount a comeback in a 52-21 loss. The Cavaliers (0-2) will try to get their offense going more on Friday at Graham (1-1). The Falcons lost 35-3 to Ohio Heritage Conference power West Liberty-Salem in Week 1 and beat Southeastern 27-14 last week. Graham had 141 yards of offense against the Tigers but racked up 375 against Southeastern. Sophomore quarterback Brady King completed 24 of 45 passes for 262 yards and one touchdown, while senior running back Camron VanHoose ran for 154 yards and two touchdowns on 21 carries. Lehman senior quarterback Elliott Gilardi ran for 76 yards on 17 carries and threw for one touchdown against the Vikings and completed 3 of 31 passes for two touchdowns with two interceptions. Bradly Haynes led Lehman with eight receptions for 160 yards and two touchdowns. If recent history is an indication, Friday’s MAC opener could be a nail biter for Fort Recovery and Minster fans. Two of their last three regular-season matchups have been decided by two points or less, including a 28-27 Fort Recovery win last year. Minster (2-0) has had a strong start to the season offensively. The Wildcats averaged 406.5 yards and 36.5 points in nonconference wins over Fort Loramie and Covington. Junior running back Alex Schmitmeyer has rushed for 260 yards and six touchdowns on 44 carries, while junior quarterback Jacob Niemeyer has completed 21 of 29 passes for 452 yards and five touchdowns, two of which have been to Trent Roetgerman. Fort Recovery (2-0) ranks last among the 10 MAC teams in yards (258.5) and points (25) per game after nonconference wins over Lehman and Valley View. The Indians’ defense, however, is fourth in the MAC by allowing an average of 258 yards and 14.5 points. Fort Recovery quarterback Clay Schmitz has completed 21 of 41 passes for 334 yards and three touchdowns with two interceptions. Gavin Thobe has caught seven passes for 144 yards and two touchdowns, while Clayton Pearson has caught six passes for 95 yards and 1 TD. Junior linebacker Owen Sheridan leads the MAC with 30 tackles. Riverside will try to get on the board this week after being shut out in consecutive nonconference losses to Ansonia and Mechanicsburg. The Pirates struggled against Mechanicsburg last week as they managed 152 yards of offense. They’ll look to do better against Indian Lake (0-2), which has had similar struggles. The Lakers lost 40-7 to Marion Pleasant in Week 1 and 27-12 to Fairbanks in Week 2. They had 154 yards of offense against and 333 against Fairbanks, but converted 6 of 20 third and fourth downs. Versailles (1-1) picked up its offense in a big 47-14 win over Delphos Jefferson last Friday but has a big test top open MAC play with Coldwater. The Cavaliers are off to a 2-0 start and beat Division IV power Clinton-Massie last Friday. They’ve averaged 41.5 points and 392 yards in their first two games. Quarterback Jake Hemmelgarn has thrown for 524 yards and seven touchdowns with one interception. Versailles gave up 416 yards of offense in a season-opening loss but allowed 100 against Jefferson. The Tigers had 397 yards in Friday’s win, with 242 coming on the ground. Eight different players had carries for the Tigers.